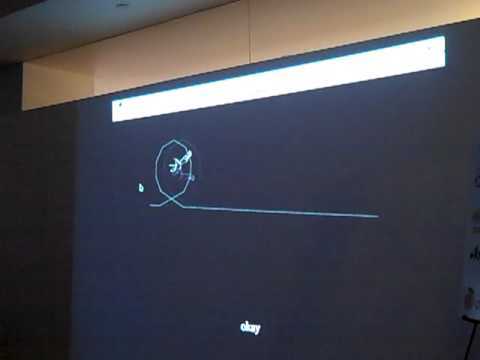 There is nothing quite like a line-art rabbit running frantically in two-dimensional space while avoiding musically-synchronized obstacles to really light up the crowd at Music Hack Day, as the above video demonstrates. Robert Böhnke’s homage to the Japanese cult classic PlayStation game Vib Ribbon, which he cunningly named “Vib Riboff,” uses HTML5 to make a browser-based videogame out of music. His creation runs (or, rather, will run) songs stored on SoundCloud through The Echo Nest’s API to find out when the rhythmic elements occur (The Echo Nest publishes Evolver.fm), which is how it knows where to place obstacles for the line-art rabbit. The result: a mind-bending, blindingly fast game that runs entirely in the browser, that asks you to navigate obstacles in real time and rates your performance as you do so with pithy text messages below the action. The demonstration to which Böhnke treated the crowd at Music Hack Day New York ran only one predetermined track, although it was streaming live from SoundCloud. Once Vib Riboff is ready for the public, he plans to allow users to play any track on that service within the game. While this game offers some short-term amusement, it also shows what’s possible with HTML5 and media engines like the ones available to participants at Music Hack Day. Guitar Hero this is not, but then again, the world already has one of those (actually, two, if you count Rock Band), and people already seem to be growing bored of those. However, one can easily imagine bands uploading songs into Vib Riboff or something like it, and tweeting it to their fans as a simple, addictive way to promote new singles.